This is one of the cheesiest styles of pants made in the 70s. 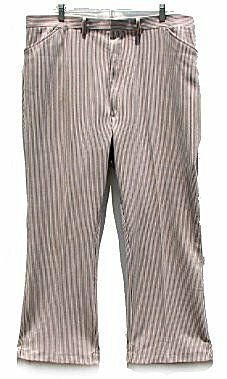 When I had my store guys attending 70s theme parties guys fought over this type of pant. The brown background is dissected by white stripes. The pants are made out of a comfortable polyester knit that is mildly stretchy. This pair has a 44" waist for a 43" fit. The length is approximate 28.5 ". They are in great condition. We have washed them and I don't see any signs of wear or imperfections. They are machine washable and dryable inside out as always.